8-Bit Armies is a game developed by Petroglyph Games. It’s actually two years old already. At least the PC version is. Now the console versions have been released, so gamers on the PlayStation 4, Xbox One and Nintendo Switch, can enjoy the ‘Voxel’ art of the game. 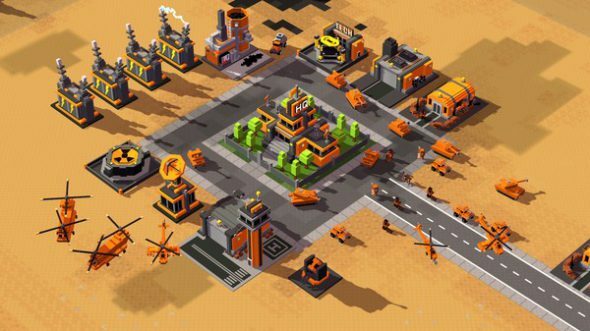 8-Bit Armies has already spawned spin offs like: 8-Bit Hordes and 8-Bit Invaders. Where 8-Bit Hordes has a fantasy setting, 8-Bit Invaders has a Sci-Fi setting. 8-Bit Armies is a homage to 90s strategy games like WarCraft 2, and has a more down to earth setting, so no battles against fantastical monstrosities. There’s always two sides to a story. This wisdom can be applied to 8-Bit Armies. There’s the side of the ‘Guardians’ and the ‘Renegades’. The story is done via mission briefing on the mission select screen, and the writing is over the top on both sides. Where the ‘Guardians’ are going for the whole ‘holier than thou’ Templar approach, the ‘Renegades’ come across as ‘scorched earth’ types seeing anyone who isn’t a part of their troops as ‘invaders’ who are worth less than dirt and should take their place in it. That’s all the story you’ll get, there aren’t any cutscenes or ‘show’ moments, just lots of tell. To be fair, however, this game lends itself better to tell over show. The visual style of 8-Bit Armies is called Voxel. WhatIs.com defines ‘Voxel’ as: A voxel is a unit of graphic information that defines a point in three-dimensional space. Since a pixel (picture element) defines a point in two dimensional space with its x and y coordinates, a third z coordinate is needed. In 3D space, each of the coordinates is defined in terms of its position, color, and density. 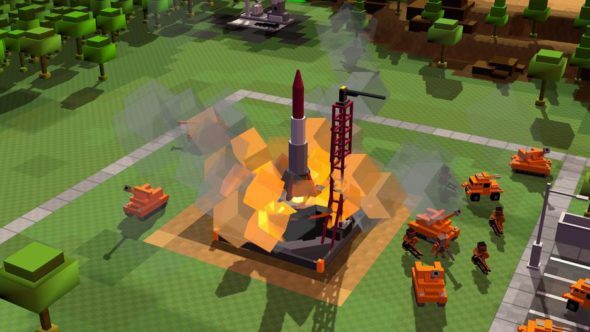 8-Bit Armies uses a polygon to render the ‘Voxels’ as blocks, like Minecraft. So the game has a ‘Minecraftian’ look to it, making is accessible to younger audiences. The maps are all unique and distinct. What needs to be said however is that environmental dangers aren’t dangers at all. The lava on some maps won’t damage your troops like you think they would, which defies most logic and is a bit confusing, but once you’ve gotten the hang of that, there aren’t any obstacles between you and the enemies. The soundtrack has been composed by Frank Klepacki who is also known for composing songs for games such as Command and Conquer, Command and Conquer: Red alert 2 and Command and Conquer: Red Alert 3. So it has to be said that the soundtrack is banging. There’s a slight differentiation between troops in that they sound subtly different from one another, so when you command them, you can hear by their voice which exact ones you are commanding, even if you aren’t keeping track of where they are on the field at that particular time. 8-Bit Armies is a Real Time Strategy -RTS for short- game. It involves making a lot of tactical decisions like in any RTS, though this game doesn’t slap first comers to the genre on the wrist too hard. 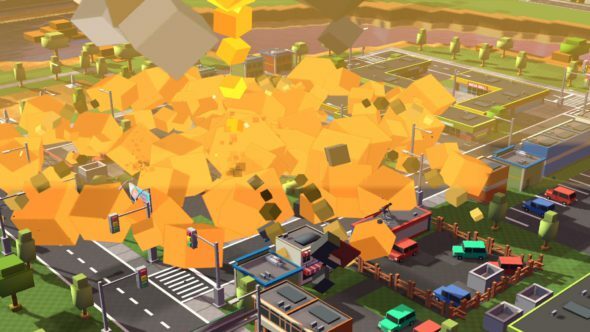 Usually RTS games have the ‘throw you in, learn to swim’ approach to their gameplay, making them a formidable foe to get into if you are new to it, and the vast amount of content these games offer can be daunting. 8-Bit Armies doesn’t differ from that approach, too much, but does however make it so newbies can opt for the lower difficulty setting, so they can get a feel for the game and its mechanics. Where the easier difficulty levels are a real pushover, dialing it up will net you some more challenge. There are two campaigns one for the ‘good’ faction, and one for the not so good one. They don’t really play any different, seeing as they are all about wiping the opposition off the map. If you’ve cleared a map, you can always choose to replay it on a harder difficulty while getting the silver and gold stars by completing optional objectives. Like clearing a map in a certain time frame, limiting the amount of troops you have, only using one set of troops, having only a set amount of buildings and so on. All these add to the challenge, because if they get destroyed, and you plop down another, that means you’ll have to start over again. These challenges are on higher difficulties so the NPCs won’t pull their punches. Controlling your troops is really, really intuitive. You can map a certain troop to one of three face buttons. Square, Triangle or Circle, if you press this button the squad will take notice and pressing X will make the designated troops go where the marker is or attack the building you’ve selected. It’s great how this gameplay translated to the rather limited means of controlling on consoles. The developers have done a real good job on making the controls as fluid as possible. The console version of 8-Bit Armies is a great port because of the fluid control scheme. The easier difficulty levels make it so newcomers to the genre can just dive in, while the harder difficulties give players a challenge. The game also comes with the 2 free DLC packs for even more RTS fun. With a lot of content, this game will give you quite a bang for your buck, whether you are Guardian or a Renegade in the streets. Next articleMpow EG3 Gaming Headset!! What A Deal! !